Perusing Instagram this early morning, I came across this photo. It made me stop and think about money. You see, I have a lifetime struggle with money. In the past, I felt like I never and would never have enough. It is somewhat surprising, too. I have so much to be grateful for and so many neat ways my husband and I spend our money, which we earn from both of our salaries. As I think you already know, we have two small places to live - one in Maryland and one in Colorado. A say small, but really they are just the right size for our family of four (Jedi included, of course). If you want specific square footage, our Colorado condo is right around 900 square feet. Our Maryland home is 1,800 square feet. In fact, I would say our Maryland home is one room too big for us. We believe two small homes equals one big place to live. Plus, we are thrilled to share time in both states. We also believe a learning environment that resonates with Lil O's learning preferences is of the utmost importance to her being. Thus, we go out of our way and drive by two public schools to send Lil O to a private Montessori school where she soars. It is surprising to some of our friends as our public school district has a great reputation, yet we choose to pay over $10K a year for Lil O's schooling. I tell you all this because with two mortgages and private school tuition, we are certainly not living the life of paupers. We have enough. And that is the point of this blog post. A wise coaching friend, when I shared my lifetime money struggle, suggested I read The Soul of Money by Lynne Twist. I did. And so many of Twist's words spoke to me. The biggest message for me was there is always enough money when we do what we love and align with our values. That's me! I am addicted to doing what I love and living a life aligned with my values (which includes my values of joy, connection, creativity, and taking initiative). Be a steward of money and not a gatherer. If you do what you love, sufficiency follows. We create our most lasting legacy in the way we live. Let your money express your soul. I am not through my lifetime struggle with money, but I am redefining what money means to me. Money doesn't have to feel scarce. It doesn't have to be never enough. 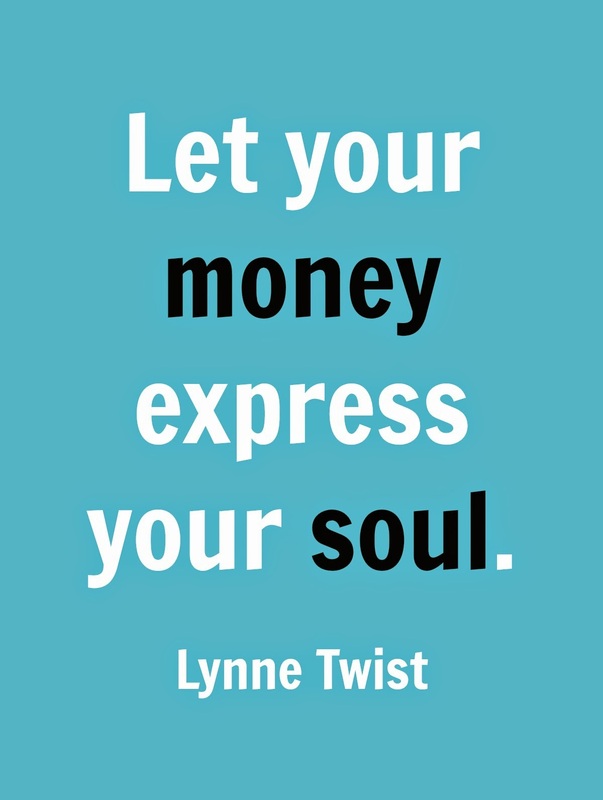 Instead like Twist suggests, money can express my soul and my family's soul, too. Does the way you gain money or spend money express your soul? It's an interesting question to ponder. I'm thinking about it myself. Amazon affiliate link included in this post - talking about money and making money all in the same post. Ha!